A million years ago, a longtime pattern of alternating glaciations and warm periods dramatically changed, when ice ages suddenly became longer and more intense. Scientists have long suspected that this was connected to the slowdown of a key Atlantic Ocean current system that today once again is slowing. A new study of sediments from the Atlantic bottom directly links this slowdown with a massive buildup of carbon dragged from the air into the abyss. With the system running at full speed, this carbon would have percolated back into the air fairly quickly, but during this period it just stagnated in the depths. This suggests that the carbon drawdown cooled the planet—the opposite of the greenhouse effect we are seeing now, as humans pump carbon into the atmosphere. But if the current keeps slowing now, we should not expect it to help us out by storing our emissions; possibly to the contrary. The study, led by researchers at Columbia University's Lamont-Doherty Earth Observatory, appears this week in the journal Nature Geoscience. 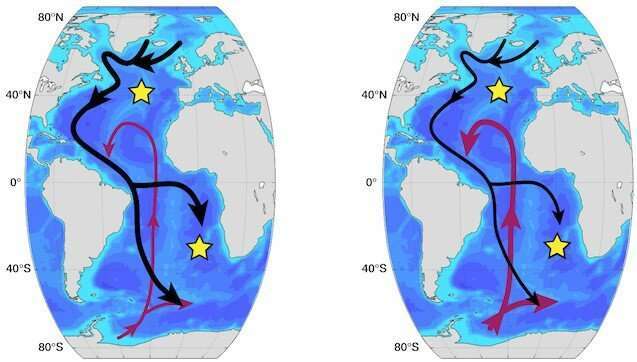 The scientists targeted a system of currents called the Atlantic meridional overturning circulation, or AMOC. Flowing northward near the surface, it transports warm, salty water from near the equator into the latitudes near Greenland and northern Europe. Here, it hits colder water from the Arctic, becomes denser and sinks into the abyss, taking with it large amounts of carbon absorbed from the atmosphere. The deep water then circles back south, where much of it re-merges in the Southern Ocean, to release carbon back to the air. The journey takes place over decades to centuries. A 2014 study by Lamont-Doherty geochemist Steven Goldstein and his then student Leopoldo Pena-both of whom also are coauthors of the new study-showed that this current abruptly slowed around 950,000 years ago. The new study shows that this slowdown correlated directly with a huge buildup of carbon in the deep Atlantic, and corresponding decline of carbon in the air. This event was the apparent trigger for a series of ice ages that came every 100,000 years, versus previous ones that occurred about every 40,000 years, and which built up less ice than those that came later. Scientists call this turning point the Mid-Pleistocene Transition, and the new pattern has persisted right through the last ice age, which ended about 15,000 years ago. Exactly why the pattern has continued no one knows, but the study clearly demonstrates that the carbon missing from the air ended up in the ocean, and had a powerful effect on climate. "It's a one-to-one relationship. It was like flipping a switch," said lead author Jesse Farmer, who did the work while a Ph.D. student at Lamont-Doherty. "It shows us that there's an intimate relationship between the amount of carbon stored in the ocean, and what the climate is doing." At some point, the current woke up again, and things warmed for a while before dropping back into another similarly extreme ice age, after 100,000 years. "There are lots of ideas about what caused these changes to happen, but it's hard to say what the trigger was," said Bärbel Hönisch, Farmer's advisor and coauthor of the study. "There are several different screws you could imagine turning, and lots of loose screws." One idea, espoused by Goldstein's group among others: In the north, repeated build-ups of glaciers ultimately scrape everything on land down to bedrock. Subsequent glaciers are then able to stick fast to the bedrock and bulk up even more, before discharging icebergs into the ocean. This introduces more freshwater to mix with the AMOC, making it less dense and eventually unable to sink. On the other end, ice would also grow in Antarctica and discharge more icebergs, which would make the ocean waters colder and less salty, thus encouraging the growth of more sea ice. This, theoretically, would cap the surface and keep deep water from rising and releasing its carbon. But if this is indeed the way it works, it is not clear what starts or ends any of the processes; it is a chicken-and-egg kind of question. The strength of the AMOC is believed to fluctuate naturally, but it appears to have weakened by an unusual 15 percent since the mid-20th century. No one is sure what is behind that, or what effects it might produce if the slowdown continues. Another Lamont-Doherty study last month showed that a slowdown around 13,000 years ago, at the tail end of the last ice age, was followed 400 years later by an intense cold snap that lasted centuries. "We have to be careful about drawing parallels with that," said Farmer, now a postdoctoral researcher at Princeton University. "We see a similar weakening today, and one might say, 'Great! Ocean circulation is going to save us from warming climate!' But that's not correct, because of the way different parts of the climate system talk to each other." Farmer said that if the AMOC continues weakening now, it is probable that less carbon-laden water will sink in the north, at the same time, in the Southern Ocean, any carbon already arriving in the deep water will likely keep bubbling up without any problem. The result: carbon will continue to build in the air, not the ocean. 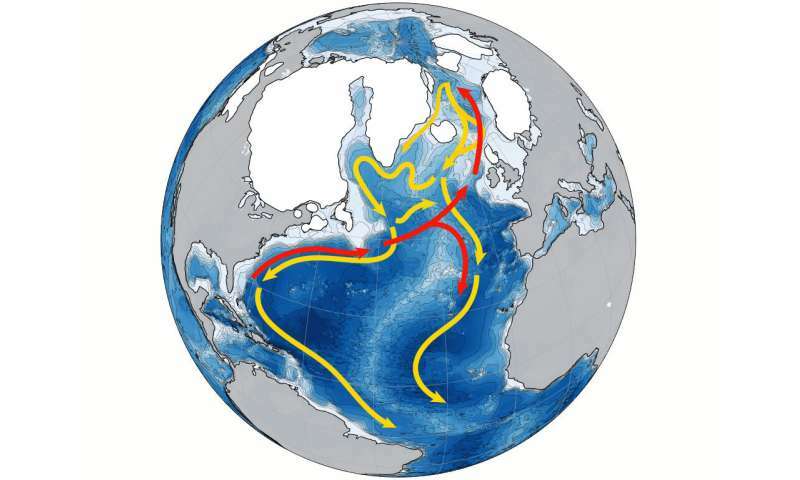 The researchers point out that the AMOC is only part of a much larger system of global circulation that connects all the oceans—the so-called Great Ocean Conveyor, a term coined by the late Lamont-Doherty scientist Wallace Broecker, who laid the groundwork for much of the current research. Much less is known about the carbon dynamics of the Indian and Pacific, which together dwarf the Atlantic, so there are many missing pieces to the puzzle. Ongoing research at Lamont-Doherty is aimed at building carbon chronologies of those other waters in the next few years. Yet many papers claim that Co2 levels lag climate changes. This is in direct conflict with the ice core data. Academic papers, not tabloid newspapers. Milankovitch Cycles are the "DRIVERS" of climate CO2 is just the exhaust of the change in the orbit cycle system. No ice cores exist from 940,000 years ago. Even at reasonably recent times, there is barely sufficient resolution in the ice core data to conclude that in those times, CO2 lagged temperature change. So why did you need to lie about it? LOL. You have a 5 year old's perception of climate science. There is no exhaust from the Earth. So why did you find yourself needing to say such a stupid thing? This is an awesome article, but I am sure it is saying the sky is falling. CO2 lags temperature change, because CO2 is released as temp increases. This is not only scientifically accurate, but makes total common sense.